What’s in a name? A lot actually. Glance down at your map and spot a road named Caliente-Bodfish or Devil’s Backbone and just try not be curious about it. The same is true for any road with the word ‘Sky’ in it. Like ‘Skyway’ or ‘Skyline’. It’s just sounds awesome, doesn’t it? Well, in our experience they are awesome, so this week we’ve highlighted a few of our favorite “rides to the sky” so to speak. Skyline Drive south of San Francisco, Skyline Drive near Canon City, Colorado and Cherohala Skyway. Do yourself a favor, pull out your map, circle these roads and figure out a way to go ride them. Skyline Drive – Bay Area: If you’ve ridden in Northern California, you’ve likely taken a spin along Skyline Drive south of San Francisco. It’s a local favorite and for good reason. Skyline runs a ridge that divides the Pacific Ocean and the ritzy communities of Palo Alto and Mountain View and like most good roads, it’s twisty, undulating and scenic. Even better, there are a handful of roads that peal off of Skyline proper and head toward the ocean or valley. These little obscure paths of pavement can be connected in a number of ways to make one heck of a ride. A few of our favorites include: King Mountain Road, Page Mill and Alpine Road. If you find yourself here, don’t pass up the opportunity to stop for a bite at the famous Alice’s Restaurant. Just look for a parking lot full of motorcycles and crowds of people gawking at them. Cherohala Skyway: Cherohala is located in the southwest corner of North Carolina along the Tennessee boarder and pretty much epitomizes what we consider an epic ride. At the cost of $100 million to build, it should be incredible. The road covers just over 40 miles and takes you from 900 feet up to over 5400 feet along the way. Long sweeping corners, scenic vistas, waterfalls–it pretty much as it all. Skyline- Canon City, Colorado: This is not exactly like the other “sky” rides on our list but it’s pretty darn cool so we feel you should know about it. This Skyline is just a few short miles but it packs a big punch in a short distance. If you don’t know it’s there you’re likely to pass it on your way up US Highway 50 from Canon City. Just outside of town keep your eyes peeled up and look for a dodgy looking arch that marks the entrance to Skyline. It’s one-way only, so there is no access to it from town. Get up on the ridge and you’ll see why this made our list. You’ll be riding slow, which is just fine because the view and exposure warrants some attention. As for Caliente-Bodfish and Devil’s Backbone, those are actual roads as well and darn good ones! We just might highlight those in a future issue of our Armchair Adventures. In the meantime, here’s a hint: Dig deep into your Southern California and Utah Butler Maps. After seeing it marked as a G-1 on the Texas Hill Country Butler map, a couple weeks ago we rode Skyline Drive near Comfort, TX. Spectacular is an understatement! We will definitely be back to ride it again. The Devil’s Backbone nearby is also a great Hill Country ride. We’ve also used the Ozarks map to ride in Arkansas and found several great routes we probably would have passed by. We bring our Butler Maps on car rides too! Colorado is next, and there’s so much more to explore thanks to Butler Maps! Yes, yes and yes. Yes, I’ve done Skyline many times beginning at Hwy 92 to its end near Hwy 17, a ride that winds much of much of its length in the shadows of coastal redwoods. And “The Devil’s Backbone?” Yes. That’s a small section of my favorite ride anywhere this side of the Alps; the Grand Staircase Escalante. Awesome. A motorcyclist’s Mecca to where all riders should plan a pilgrimage. Yes, I will seek out Skyline out of Canon City now that I spend summers in Denver. Thanks for the hot tip! 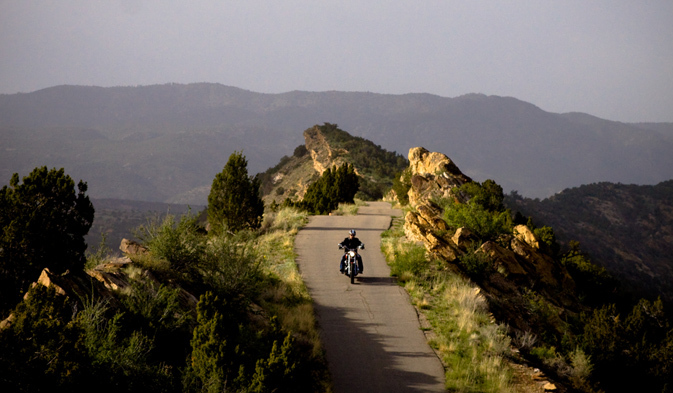 Excellent road….Can be scary, take it slow on a motorcycle or car but worth the ride from Canon City, Co. I live pretty close to Cherohala and it is GORGEOUS. Long sweeping curves and beautiful mountain views the whole way. Having grown up in Escalante, UT I’m unaware of a Devil’s Backbone but there is the narrow strip of highway across the ridge on UT-12 above Calf Creek known as the Hogsback and the nearby national forest road 153 going through Salt Gulch and the narrow wooden bridge known as Hells Backbone.